The hottest new toy for the 2016 holiday season is the new Hatchimals from Spin Master. This unique item is reminiscent of a real life Tamagotchi, mixed with a Furby. While they are fairly new, they are expected to fly off shelves in the coming months! We are curious to see if the new Hatchimals lives up to the hype, so keep reading our Hatchimals review. Hatchimals are an interactive toy, that let you “raise” your Hatchimal through several stages of life. The Hatchimal itself comes inside an “egg shell” and after Hatching, you play through “Baby Stage”, “Toddler Stage”, and “Kid Stage”. 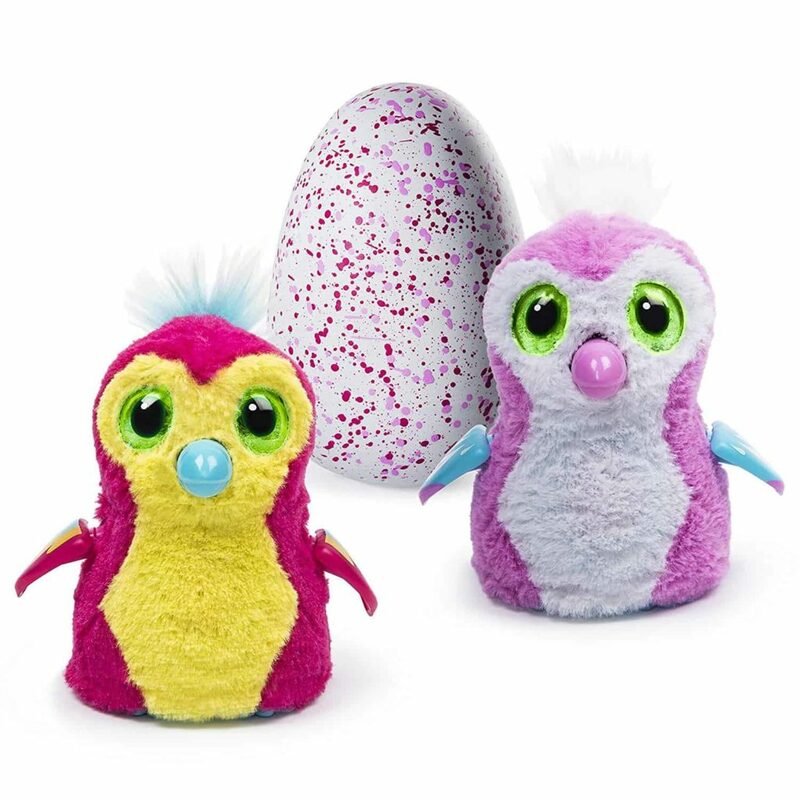 You can choose from several different “species” (models) of Hatchimals, such as a Penguala, Draggle, Burtle, Bearakeet or Owlicorn. The unique thing is that you wont know exactly which color of Hatchimal you’ve got until it hatches! Our Hatchimals Review will cover what is included, and what to expect from this futuristic toy. We opted for one of the “Penguala” Hatchimals, that has a pink speckled egg.The box itself has a faux egg shell on the top that lets you see the color of the egg, which is the same as inside the packaging. It is important to read the instruction guide before beginning, because it tells you how to “unlock” the pins on the bottom of the Hatchimal egg to activate your new pal! The packaging is a little tricky to remove so be sure to help your little one with this process. The In Egg is the first life stage of the Hatchimal, and it is up to you to nurture the egg, and get your Hatchimal to hatch. 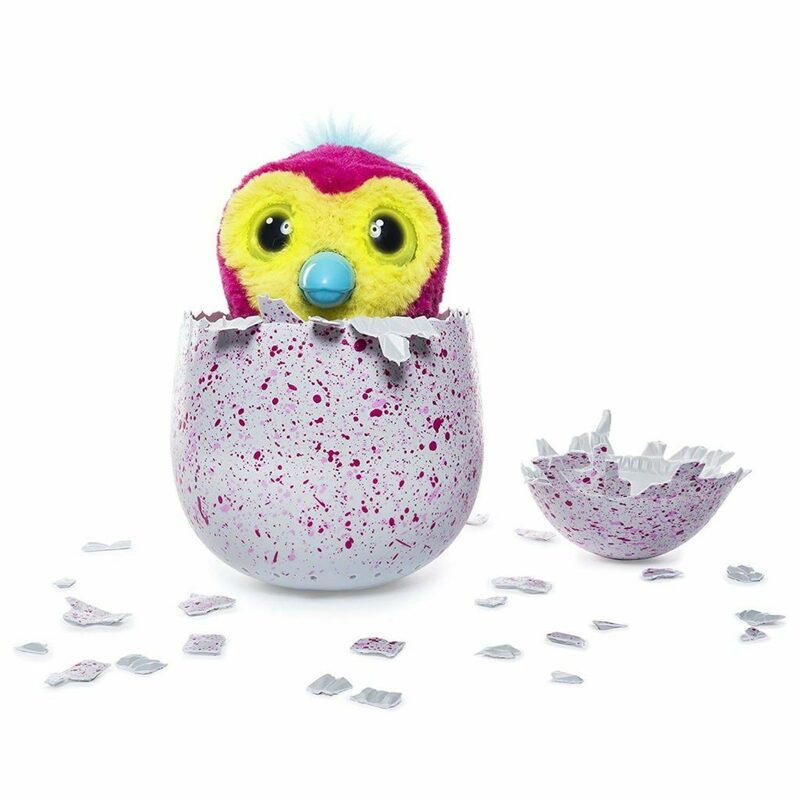 Each Hatchimal is unique, so it can take anywhere from 10-40 minutes to hatch. The more you play with your Hatchimal, the sooner it will hatch. During each stage, Hatchimals will display different eye colors. Each eye color corresponds to a different emotion, and the reference guide is a handy way to see what you should do for each eye color. For example our Hatchimal displayed red eyes, meaning it is feeling upset. To make the Hatchimal feel better, we rubbed the bottom of the egg and it feels better. During the In Egg stage, you can rub it, talk to it, and even tap on the shell and the Hatchimal will tap back! When your Hatchimal is ready to hatch its eyes will flash rainbow colored eyes when it is ready to come out! When its eyes flash it is ready to hatch, but the Hatchimal won’t come out without encouragement. If you rub the sides of the egg, the Hatchimal will tap until it has broken most of the shell. This time can vary up to 30 minutes, but we rubbed continuously, and our Hatchimal came out after 15 minutes. We did have to free the Hatchimal by pulling it from the shell. Since the shell can break into small pieces while hatching, its best to have the Hatchimal on a clean surface such as a table top. Pull the Hatchimal out of the shell until you hear a “click”, and be sure to discard the empty shell pieces because you wont need them again! In this stage, the Hatchimal is just an enfant. It makes cute little baby noises and needs lots of attention. During this stage you can cuddle the Hatchimal by patting its head, or feed it by tiliting is head into your palm. Check out the eye color guide to make sure you’re giving the Hatchimal exactly what it needs in this stage. Our Hatchimal displayed yellow eyes and that means it is ready for play time! To play with the Hatchimal you can swing it around and it makes an adorable “wheeee” sound. When your Hatchimal has grown up more, its eyes will flash rainbow color again. The Hatchimal will sing “Hatchy Birthday” to signal that it is moving into the Toddler Stage. During the Toddler Stage, the Hatchimal needs to learn things just like a real Toddler does. It is up to you to teach the Hatchimal how to walk and how to talk, and even how to dance. We started with the talking stage, and if you squeeze the Hatchimals belly, and say “hello” the Hatchimal will repeat it back! You teach it to walk by squeezing its belly until its eyes turn solid white, and tapping its head to lock it into the “listening mode”. One clap will teach the Hatchimal to move forward, and it can even spin around. The little wheels on the bottom make it easy to move, but we found it works much better on a smooth floor, than it does on the carpet. The Toddler Stage is super fun because you can really see the amazing range of things this little Hatchimal can do. Whevenever the Hatchimal completes the cycle of learning, it is ready to grow into the “Kid Stage”. This Stage is the final growth stage for your Hatchimal. Before transitioning into the Kid Stage, the Hatchimal will once again have rainbow flashing eyes and sing “Hatchy Birthday”. In this stage the Hatchimal is growning up, and really loves to play. There are some really cool games you can unlock and then play with your Hatchimal during the Kid stage. Our favorite game to play was the “Tag” game. In this game, your Hatchimal moves, and when its eyes flash red, you tap its head to “Tag” it. When you’ve tagged your Hatchimal 15 times, you win! By far this stage is the most intertesting because the Hatchimal can do so much more. The thing we love about the Hatchimal is that its easy to move back to the baby or toddler stages, at any time. 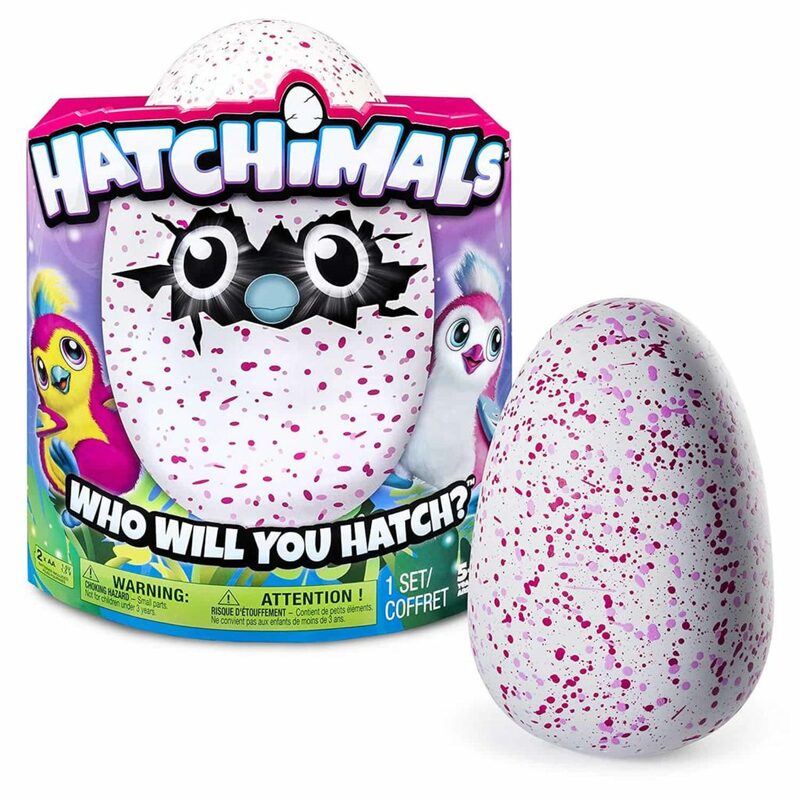 Overall we think that the Hatchimal is a great pick for this Holiday season. We really liked the cool options in each of the stages, which will entertain children for hours on end. “Nurturing” the egg to hatching, and teaching the Hatchimal makes it much more interactive than similar toys like the Furby. We were blown away by the responsiveness of the Hatchimals, making it a great choice for children as young as 4, up to the 11+ range. We hope this Hatchimals Review was helpful, and Happy Hatching!